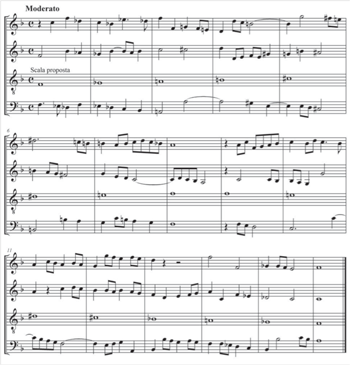 ABSTRACT: On August 5, 1888, the Gazzetta musicale di Milano challenged its readers to harmonize a curious scale that it had received from a famous Bolognese musician. Two weeks later, the journal’s editors published several commendable solutions, including one by the scale’s inventor, Adolfo Crescentini. The Gazzetta’s “scala-rebus” (or scale-puzzle) would likely have been forgotten were it not for the fact that Verdi wrote his own solution (not published in the journal), which formed the basis for his Ave Maria and later found its way into his Quattro Pezzi Sacri. This article examines several solutions to the “scala-rebus,” focusing especially on Verdi’s. Yet it goes even further, proposing that Crescentini’s scale inspired not only Verdi but also Puccini. The opening measures of Puccini’s Tosca bear striking similarities to the “scala-rebus,” suggesting that in composing this opera Puccini was making use of one of his favorite compositional strategies: returning to old material—in this case, to a curious puzzle that may well have preoccupied him twelve years earlier. Editorial note: Richard Burke (1950–2015) was a brilliant musician of extraordinary scope: a penetrating musicologist who explored repertoires from Beethoven through Shostakovich and beyond; a prolific composer who wrote opera, concert works, television scores, cabaret songs, and ballet scores (including collaborations with choreographer Twyla Tharp); a pianist, conductor, and music director who helped found the celebrated comedy troupe La Gran Scena Opera Company; and a dedicated professor at Hunter College and the Graduate Center, CUNY. He penned the following essay shortly prior to his sudden final illness, and he passed away before having a chance submit it for publication. With the permission of his estate, this essay was submitted on his behalf to Music Theory Online. The Gazzetta musicale di Milano, one of the most widely read music journals in Italy in the second half of the nineteenth century, was published by Casa Ricordi and often functioned as a promotional vehicle for composers and compositions associated with the powerful publishing house. Not surprisingly, the front page of the journal was usually devoted to opera, with La Scala premieres enjoying a particularly large portion of the coverage. Items of interest to local musicians were pushed to the rear, along with communications from subscribers, death notices, advertisements, and snatches of verse. Among the regular features was a contest in which readers were invited to solve some sort of musical puzzle, usually called a “rebus” or “sciarada” (game). The entries were judged and awarded prizes in a manner similar to that of many present-day magazine competitions. Four winners were chosen by lot from the pool of correct solutions, each receiving something similar to a gift certificate, redeemable, of course, in Ricordi publications. As might be expected, the Gazzetta affords an interesting glimpse of the hot topics of the day. In 1888, for example, there were feature articles devoted to the dramatic theory of Richard Wagner, including some Italian translations of his writings, a group of Mozart’s letters, a good deal of discussion of the upcoming premiere of Franchetti’s Asrael, and coverage of the death of Tito Ricordi himself, famed director of the publishing house, who had just handed over the reins to his son Giulio. On August 5 of that year, among the notices and diversions of the final pages of the journal, a tiny item appeared under the heading “Curiosità . . . harmoniche.”(1) It offered a challenge to the readers (see Example 1). Crescentini’s own harmonization, shown in Example 2, is indeed effective. The editors of the Gazzetta said it was “naturally the most homogeneous” (omogenea) of the solutions, perhaps out of respect for the inventor (1888b, 320). Interestingly, Crescentini’s version is the only one that includes figured bass, a sign pointing to his understanding of the challenge as one of simply harmonizing a bass. Despite the bare-bones, note-for-note approach, there is a good deal of craft here, evident in the nicely shaped soprano line, with its stepwise descent in contrary motion with the bass in the first eight measures, and its rise to a climactic A in the second eight measures (the leap would be considerably less visually striking had Crescentini spelled the chords in mm. 11 and 12 enharmonically as C dominant 7th and D major). The inventor’s harmonization also points out some of the pitfalls built into the challenge. The relentless rise and then fall of the bass make the double unison in m. 8 difficult, though certainly not impossible, to avoid; the D in the penultimate measure defies the reader to come up with a chord other than the second inversion of an altered dominant seventh; and the repeat of the C in mm. 8 and 9 will prove problematic for those who see the bassline as a continuous sixteen-measure piece rather than as merely an ascending scale followed by its descending counterpart. 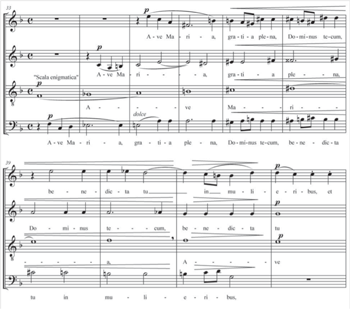 Norsa manages to create some momentum by starting each phrase on the second half of the measure (no meter was specified by Crescentini), and by moving in half and quarter notes. The hint of imitation between the tenor and alto in mm. 10–12 helps unify the second half of the realization. The final measures, however, are a bit weak, as the motion becomes static. In his solution to the challenge, shown in Example 4, Giuseppe Cerquetelli(6) effectively uses fourth species in the soprano to create a similar sense of motion, but his harmonization is more homogeneous (to use the Gazzetta’s own word) than Norsa’s and progresses with some momentum to the end (some might object to the parallel octaves on the accented beats between soprano and tenor in mm. 4–6) (1888b, 319). Cerquetelli also succeeds in keeping things moving between mm. 8 and 9, although the realization by Augusto Ferrari (Example 5) may be even more effective in this regard (1888b, 319). 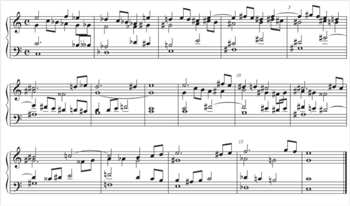 (7) Here, the diminished-seventh chord in m. 8 leans into the tonic chord of m. 9, obscuring the unfortunate break between the two sections heard in most of the other harmonizations. The sudden shift in harmonic rhythm and the Wagnerian harmonies of mm. 9–12 are oddly effective. The parallel octaves in mm. 13–14 seem unnecessary and may very well be a misprint. Finally, there is the remarkable expansion of the bass into an effective short composition by Aldo Forlì (Example 6) (1888b, 320). (8) Forlì must have realized that the strange intervallic structure of the bassline would force most realizations to ramble (see, for example, mm. 11–16 of Example 3 by Norsa, where the soprano seems to be stuck around B). Seeing the potential for building a sequence on the ascending whole steps of the bass, Forlì may very well have written mm. 3–5 first, and then derived a rhythmic motive from the passage to unify the rest. The “scala-rebus” made a final appearance on October 7, 1888, when one more solution was published, an elaborate exploration of the scale in four parts by Ottorino Varsi, which the editors said “maintained the integrity of the proposed scale,” but also “presented it in a new light.” Varsi changed the key, positioned the scale in the tenor, and added a meter and even a tempo marking. The piece, called “Contrappunto a quattro parti reali,” took up half a page of the journal (Example 7) (1888c, 371). In bringing the game to its conclusion, the editor said that there were many more submissions, but nearly all of them had “altered the original scale in some small way.” And so, the “competition” ended. Like Franchetti's Asrael, the scala would probably have been completely forgotten, save for one solution not published in the journal. It was by Verdi. The Ave Marias have become five instead of four. After a gran pausa in m. 65, there is a six-measure coda on the word “Amen” that brings the piece to a close in C major. In a sense, then, Verdi harmonized the scale four times (eight times, counting the first and second versions of the work). Of course, with the cantus migrating through the voices, he did not have to face the problems of the original assignment over and over again. He did, however, encounter a few new ones. Boito was worried that the scale, when transferred to the other voices, “would not sing naturally” (letter of March 13, 1889, in Conati and Medici 1994, 137). It is, however, precisely when the scale moves up from the bass that it works best. The third section, with the scala in the tenor, may be the most impressive of all (see Example 8). It is unfortunate that we have only those harmonizations of the scale that the editors of the Gazzetta chose to publish, and that we have no idea how many submissions there were in all. But it would be hard to imagine that any musician looking at the scale in the magazine—, especially a teacher or a composer—would not have been tempted to play the game, even if not planning to send in a solution. (16) (In much the same way, it would not be surprising to find that some of the readers of this article have already attempted to harmonize the scale themselves.) It would also not be hard to imagine that some of the musicians submitting solutions to the Gazzetta had taken a different approach, as in those by Varsi and Verdi, both of whom treated the scale as a cantus firmus, moving it up from its position in the bass. What, for example, did the editors mean when they said that some of the entries had changed the scale in “some small way”? Surely some must have made enharmonic adjustments—some of the harmonizations get themselves into less-than-ideal situations that could be averted by a few minor changes in spelling. But some readers must have conceived the entire project in ways unforeseen by either Crescentini or the editors of the journal. Some readers, for example, may have tried to treat the scale as what one would nowadays call a pitch collection, surmising that Crescentini intended the scale to provide more than just one of four lines. Certainly, a reader or two might have explored the kinds of chords that could be derived from the tones of Crescentini’s scala. It should also be remembered that most of the submissions to the Gazzetta came from musicians born in the first half of the nineteenth century. Their way of responding to the challenge of the scala was to head straight for figured bass. Even the two composers who actually saw the scala as a cantus firmus were concerned with how they could stretch the harmonic language to accommodate the odd steps of the “awkward” scale. How differently the scale and the challenge might have been viewed by a younger composer, one born in, say, the 1860s, one exposed to Wagner, Liszt, and exoticism, perhaps having had some contact, if only marginal, with world music. The essence of Scarpia—his ferocity—is caught at the opening of the opera in a musical image as astounding in its simplicity as it is graphic in suggestiveness. . . . It is, so to speak, musically inhuman; its evocation of a sinister and brute force derives from a harmonic progression of unconnected parallel chords based on the whole-tone scale. Girardi’s point is well taken. The top voice, D–E –E , is distinctly not part of the whole-tone scale. It can be found, however, in the upper section of an enigmatic scale on E (Example 10). This particular scale, given an enharmonic adjustment on its third degree, furnishes not only the upper-voice chromatic motion of the opening of Tosca, but the bass motion, B –A –E, as well. Moreover, B and A are the only degrees of this scale on which major triads can be formed using tones from the scale (including enharmonic spellings), and these are, of course, the first two chords of Tosca (Example 11). These two triads comprise six of the seven tones of the scala, leaving only E unused, which is, significantly, the next pitch in Puccini’s famous progression (Example 12). Is it possible, then, that there is a connection between Crescentini’s invention and the famous opening of Tosca? Although there is no evidence that Puccini actually saw this scale, it seems unlikely that he would not have. In 1888, when the scale first appeared, the young composer was living largely in and around Milan. Like most musicians of that time and place, he would have read the Gazzetta, the house magazine of Ricordi, especially since Giulio Ricordi himself was at this point courting him. In addition, in the summer of 1888, when the scala made its first appearance, Puccini had just finished work on his second opera, Edgar, and was negotiating details of its premiere. He might have had the time to play with the scale, and, at the very least, would have looked at it and considered some of the implications of its use. Still, why would it then make its appearance in an opera written a decade later? Puccini’s self-borrowing has often been discussed. A Salve Regina from the early 1880s found its way into Le Villi (1884). Passages dropped from his next opera, Edgar (1889), can be found in Manon Lescaut (1893). But with Manon, and a few years later with La Bohème (1896) as well, the material that Puccini salvaged from his earlier works is used for one specific purpose—to open the opera. A slightly varied version of the second of the Tre minuetti, written in the early 1880s, provides the music of the first pages of Manon. In a similar manner, La Bohème begins with ideas from an earlier piece, the Capriccio sinfonico of 1883. In both cases, these ideas persist beyond the first pages of the score, playing an important role throughout the first act. When seeking a grotesque musical gesture to capture the cruelty of Scarpia, Puccini may have been reminded of the “awkward” scale and the musical idea he developed from it. In fact, it is possible that the opening of Madama Butterfly, the opera that follows Tosca, may continue the practice and be similarly based on a work from Puccini’s youth. The opening fugue for strings—a conventional exposition whose shards and chunks of restatements and episodes are scattered around the opera’s first act—may very possibly have begun life as an academic exercise from Puccini’s youth, like the strikingly similar Three Fugues for string quartet from 1883, all written perhaps with the fugal finale of Verdi’s 1873 quartet in mind. Like the fugue that opens Butterfly, these are distinctly instrumental pieces, conceived for and expertly suited to strings. Bach, Hans Elmar. 2001. “‘ . . . gigante anche quando giuoca’: Zwei Fassungen der ‘Scharade’ Ave Maria von Verdi.” In Aspetti musicali: Musikhistorische Dimensionen Italiens 1600 bis 2000, Festschrift für Dieter Kämper zum 65. Geburtstag, ed. Norbert Bolin, Christoph von Blumröder, and Imke Misch, 225–34. Verlag Dohr. Basini, Laura. 2004. “Verdi and Sacred Revivalism in Post-Unification Italy.” 19th-Century Music 28, no. 2: 133–59. Budden, Julian. 1992. The Operas of Verdi, vol. 3: From Don Carlos to Falstaff. Clarendon Press. Budden, Julian. 2002. Puccini: His Life and Works. Oxford University Press. —————. 2002. Puccini: His Life and Works. Oxford University Press. Carner, Mosco. 1959. Puccini: A Critical Biography. Knopf. Cesare, Gaetano and Alessandro Luzio, eds. 1913. I copialettere di Giuseppe Verdi. Stucchi Ceretti. Conati, Marcello. 1978. “Le Ave Maria su scala enigmatica di Verdi dalla prima alla seconda stesura (1889–1897).” Rivista italiana di musicologia 13: 280–311. Conati, Marcello. 1981. “‘Torniamo all’antico,’ ovvero l’atteggiamento di Verdi nei confronti della musica vocale e strumentale, a proposito delle ‘Ave Maria su scala enigmatica.’” La Cartellina 5, no. 8: 8–25. —————. 1981. “‘Torniamo all’antico,’ ovvero l’atteggiamento di Verdi nei confronti della musica vocale e strumentale, a proposito delle ‘Ave Maria su scala enigmatica.’” La Cartellina 5, no. 8: 8–25. Conati, Marcello and Mario Medici, eds. 1994. The Verdi-Boito Correspondence, trans. William Weaver. University of Chicago Press. Frobenius, Wolf. 1997. “Luigi Nonos Streichquartett ‘Fragmente-Stille, an Diotima.’” Archiv für Musikwissenschaft 54: 177–93. Gazzetta musicale di Milano 32. 1888a. “Curiosità . . . harmoniche.” (August 5). Gazzetta musicale di Milano 35. 1888b. (August 26). Gazzetta musicale di Milano 41. 1888c. “Echi della Scala-Rebus.” (October 7). Girardi, Michele. 2000. Puccini: His International Art, trans. Laura Basini. University of Chicago Press. Scherchen, Hermann. 1951. “I quattro pezzi sacri.” Il Diapason 2 (February). 1. The ellipses here and in the next quotation appear as they do in the Gazzetta. They seem to indicate a break in thought rather than something omitted. 3. For a brief discussion of Adolfo Crescentini, see Conati 1978, 283. 4. In an essay written in 1951, Hermann Scherchen divides the scale into four parts: tones 1–3 from the minor scale, tones 3–5 from the major, tones 3–6 from the whole-tone scale, and tones 6–8 from the chromatic. See Scherchen 1951, 13–15; cited in Frobenius 1997. 5. Vittorio Norsa (1851–1937) was a theory teacher at the Conservatorio di Milano; his opera Anthony was premiered in Ferrara in 1898. 6. Giuseppe Cerquetelli (1848–1931) was the director of the Istituto Musicale Briccialdi in Terni from 1892 to 1921. His opera Ettore Fieramosca was presented at the Teatro Communale di Terni in 1895. 7. Augusto Ferrari was a teacher at the Scuola di Musica di Colorno and composer of the opera Lucidea, which was given its premiere at the Teatro Filodrammatici in Milan in 1900. 8. In the Gazzetta all of the contributors are identified as either “Maestro” or simply “subscriber,” save for Aldo Forlì and Ottarino Varsi, who are listed only by name. This omission is perhaps a sign that the editors of the Gazzetta were unable to identify them. I, too, have been unable to find additional information about either Forlì or Varsi. 9. Budden (1992, 420) suggests that working on this scale may have put Verdi in the proper frame of mind to tackle Falstaff: “From a piece of polyphony based on the solution of a conundrum to a sparkling comedy abounding in cunning verbo-musical interplay and cross-reference the step was not so large.” Marcello Conati (1978, 286) suggests something similar. 11. Later that year, at a performance in Vienna, the Ave Maria would appear for the first time as the opening movement of the Pezzi sacri. 14. For a discussion of the differences between the two versions, see Conati 1978 and 1981, and Bach 2001. 15. From a fragment of a letter in Cesare and Luzio 1913, 411n; quoted in 1978, 300. 16. One of the contributors was a violinist, Luigi Pucci (1868–1920). 18. In act 5 of Sardou’s play, Tosca says: “J’ai beau savoir que ce n’est qu’un jeu” (I know only too well that this is not a game). The line does not appear in the opera, although it is certainly possible that it might have made it into one of the drafts of the libretto. The ellipses here and in the next quotation appear as they do in the Gazzetta. They seem to indicate a break in thought rather than something omitted. For a brief discussion of Adolfo Crescentini, see Conati 1978, 283. In an essay written in 1951, Hermann Scherchen divides the scale into four parts: tones 1–3 from the minor scale, tones 3–5 from the major, tones 3–6 from the whole-tone scale, and tones 6–8 from the chromatic. See Scherchen 1951, 13–15; cited in Frobenius 1997. Vittorio Norsa (1851–1937) was a theory teacher at the Conservatorio di Milano; his opera Anthony was premiered in Ferrara in 1898. Giuseppe Cerquetelli (1848–1931) was the director of the Istituto Musicale Briccialdi in Terni from 1892 to 1921. His opera Ettore Fieramosca was presented at the Teatro Communale di Terni in 1895. Augusto Ferrari was a teacher at the Scuola di Musica di Colorno and composer of the opera Lucidea, which was given its premiere at the Teatro Filodrammatici in Milan in 1900. In the Gazzetta all of the contributors are identified as either “Maestro” or simply “subscriber,” save for Aldo Forlì and Ottarino Varsi, who are listed only by name. This omission is perhaps a sign that the editors of the Gazzetta were unable to identify them. I, too, have been unable to find additional information about either Forlì or Varsi. Budden (1992, 420) suggests that working on this scale may have put Verdi in the proper frame of mind to tackle Falstaff: “From a piece of polyphony based on the solution of a conundrum to a sparkling comedy abounding in cunning verbo-musical interplay and cross-reference the step was not so large.” Marcello Conati (1978, 286) suggests something similar. Later that year, at a performance in Vienna, the Ave Maria would appear for the first time as the opening movement of the Pezzi sacri. For a discussion of the differences between the two versions, see Conati 1978 and 1981, and Bach 2001. From a fragment of a letter in Cesare and Luzio 1913, 411n; quoted in 1978, 300. One of the contributors was a violinist, Luigi Pucci (1868–1920). In act 5 of Sardou’s play, Tosca says: “J’ai beau savoir que ce n’est qu’un jeu” (I know only too well that this is not a game). The line does not appear in the opera, although it is certainly possible that it might have made it into one of the drafts of the libretto.